Counter Burger Fundraiser Night this Wednesday! REMINDER: Please support CrossFit 808's 2 Regional teams by eating at the Counter Burger Kahala this Wednesday, April 2nd. 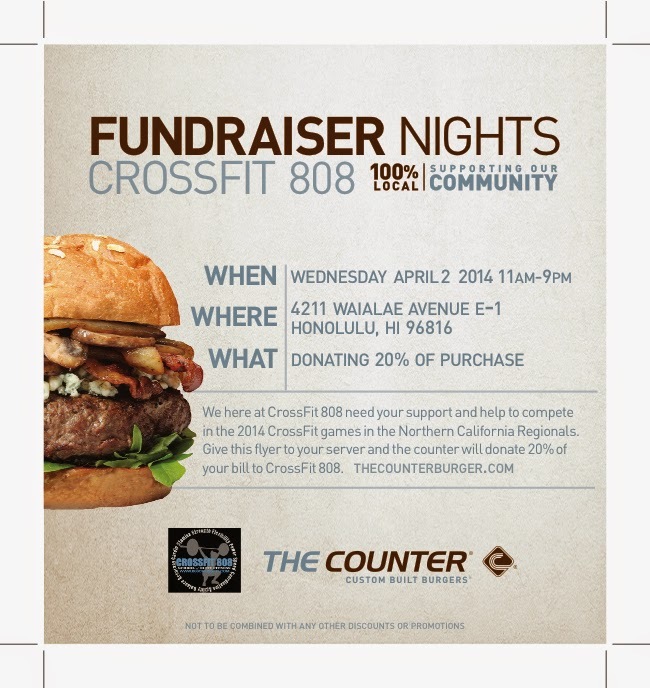 Counter Burger will donate 20% of your purchase to CrossFit 808 and CrossFit 808 Plan B! All you have to do is print this flyer (above) and bring it with you when you go eat your delicious meal at the Counter. Don't forget to tell all of your friends and family! Thank you in advance for your support! *Master's 55+ use: 65/45 lbs for Thrusters. Males: Johnson, Adam G., Jose, Kurt, and Steve R.
Doors will open at 5:00pm for athletes to come in and warm-up! First heat will start promptly at 5:40pm. If you have any questions please email Coach Elyse at elyse@808crossfit.com. NOTE: WE WILL NOT BE ALLOWING ATHLETES TO REDO THIS WORKOUT ON MONDAY; IT IS FRIDAY OR SUNDAY FOR 14.5. Thanks! Heat 1 (5:40pm): Rachel, Janet, Violet, Darin, Steve O., and Dan W.
Just a reminder: tomorrow's Open Gym for 14.4 starts at 1:00pm with the first heat going around 1:30pm, so you have plenty of time to warmup! Barbell club begins tomorrow at 10:00am! Don't forget to email Coach Josh if you want to enroll in this 8-week program! This workout begins seated on the rower with the monitor set to zero calories. At the call of “3-2-1...Go,” the athlete will grab the handle and begin rowing. If you finish the 20 muscle-ups and return to the rower, you must reset the monitor to zero before rowing. Doors will open at 5:00pm for athletes to come in and warm-up! First heat will start promptly at 6:00pm. If you have any questions please email Coach Elyse at elyse@808crossfit.com. Please keep in mind that there are over 80 athletes trying to get validation and only one Coach Elyse. Thanks! Dana, Nikki, Charlie, Jon M., and Dan W.
Week 3 in the books! Mary "The Champ" Schwing - 2nd in the world (60+ Masters), with a 7th place finish in 14.3! High scores from Rebecca (7th in NorCal), Ingrid, Katrina, Jay, Josh Showers, and Matt Beals. 3 weeks down, 2 more to go! I hope you are remembering to enjoy the experience. I saw so many of you push yourself further than you thought possible! Keep up the great work and get ready to crush 14.4! Rest 6 minutes, and then . . . . Doors will open at 5:00pm for athletes to come in and warm-up! First heat will start promptly at 5:45pm. If you have any questions please email Coach Elyse at elyse@808crossfit.com. Please keep in mind that there are over 80 athletes trying to get validation and only one Coach Elyse. Thanks! Dana, Kate I., Ashley R., Shane, Chris, and Ryan S.
Brianna, Lei F., Bill Behr, Mike Y., and Jon M.
The CrossFit 808 Barbell Club is your opportunity to enhance your strength, skill, and knowledge of the Olympic Lifts through a ton of technical drills and accessory work. This SPRING 14 segment of Barbell Club will take place on Sundays between 10am and 1pm for a total of 8 weeks starting March 23rd and ending May 11th. During each Sunday session, athletes will come in during the open hours and choose their program for the day (Beginner, Performance, or Competition) based on their needs and goals. Barbell Club pricing is on a sliding scale based on your monthly membership. Please make all checks payable to Joshua Akiona. If you are interested in attending Barbell Club and want more information, please email josh@808crossfit.com with the subject line: SPRING 14 BBC. Thanks! *Technique trumps speed. No perturbance of midline. No movement in hip, knee or head. Week 2 in the books! Mary "The Champ" Schwing - 2nd in the world (60+ Masters), with a 1st place finish in 14.2! High scores from Rebecca (7th in NorCal), Paige, Estee, Jay, Marcus and Matt Beals. I am super proud of everyone who participated in 14.2! I have such a blast watching you guys tackle the Open Workouts week after week! You guys are all doing awesome, so keep up the good work and positive mindset. Bring it on 14.3! ...so on and so forth, following the same pattern until you fail to complete both rounds in the 3-minutes. This workout begins as a standard three-minute couplet of two rounds of 10 overhead squats and 10 chest-to-bar pull-ups. If you complete all 40 reps (two complete rounds) before the time cap you will rest until the three minutes is up before beginning the next segment. In the second segment, minute 3 to minute 6, you will attempt two rounds of 12 overhead squats and 12 chest-to-bar pull-ups. If you complete all 48 reps (two complete rounds) before the time cap you will rest until the six minutes is up before beginning the next segment. In the third segment, minute 6 to minute 9, you will attempt two rounds of 14 overhead squats and 14 chest-to-bar pull-ups. If you complete all 56 reps (two complete rounds) before the time cap you will rest until the nine minutes is up before beginning the next segment. You will continue in this pattern for as long as possible. Sixteen reps of each during minutes 9 to 12, 18 reps of each during minutes 12 to 15, etc. Your workout is over whenever you do not complete two full rounds of the couplet within the time cap and your score will be the total number of reps you complete. For example, if you complete the first two rounds of 10s (40 reps) in 2:30, you will rest until 3:00 before beginning the rounds of 12s. If you then complete one full round of 12s plus an additional 10 overhead squats (34 reps) by minute 6, your workout is over. Your score will be 74 (40 reps from the first segment plus 34 reps from the second segment). Doors will open at 5:00pm for athletes to come in and warm-up! First heat will start promptly at 5:30pm. If you have any questions please email Coach Elyse at elyse@808crossfit.com. Please keep in mind that there are over 85 athletes trying to get validation and only one Coach Elyse. Thanks! Rest 3 minutes (or while partner is going). B. Take 15-minutes to build to today’s heaviest Clean & Jerk.